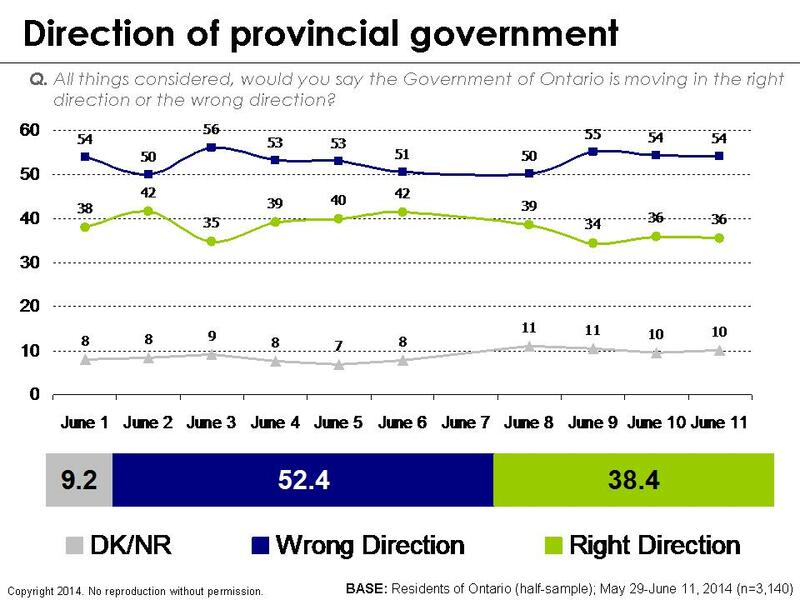 [Ottawa – June 13, 2014] After an exciting month-long campaign, the 41st Ontario general election has come to a close and we at EKOS are pleased that we accurately projected Kathleen Wynne’s majority victory. Indeed, our final poll captured both of the frontrunners to within the margin of error. 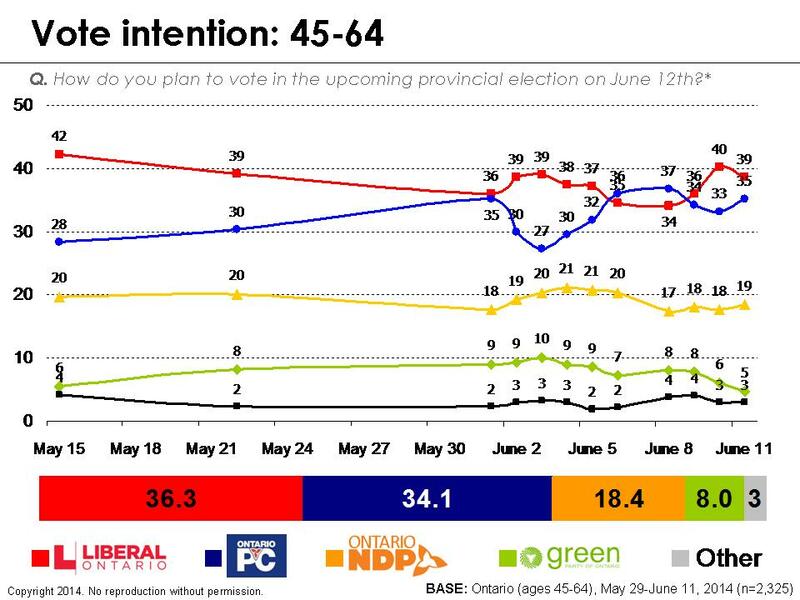 We also succeeded in noting the relative stability of the campaign, which is why we were confident in calling a Liberal victory as early as June 5th, noting that Wynne had an excellent shot at a majority government. 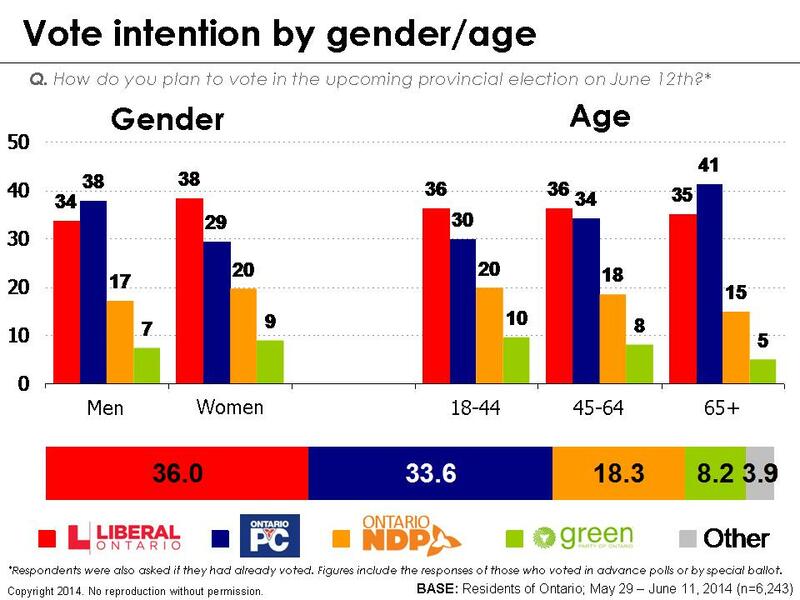 There was, however, an abrupt post-debate boost to Hudak as he that saw his Progressive Conservatives leading on two separate nights. This surge quickly subsided, however, and the results returned to their pre-debate levels. We made the majority call the evening of June 11th. Among those firms who released results in the last week of the campaign, all but one other firm saw it as leaning PC or too close to call. 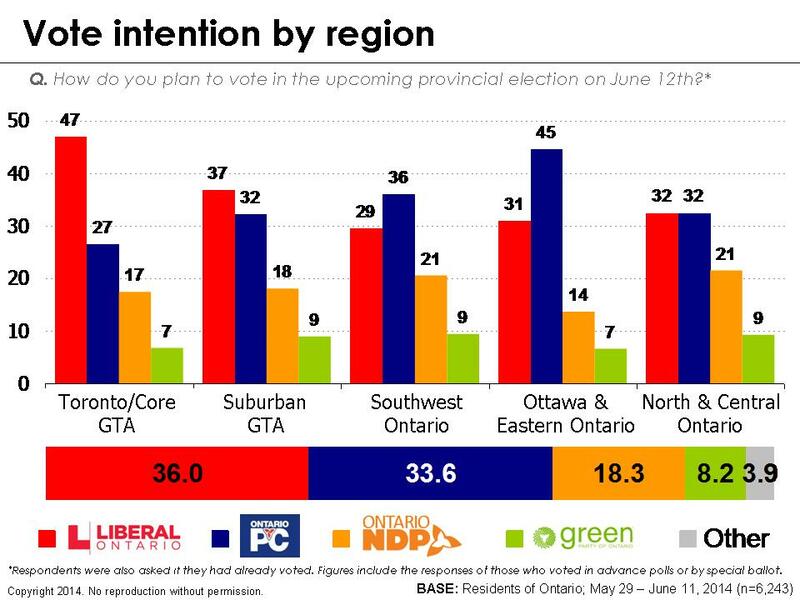 The exact dynamics of how the popular vote translates into seats are complex and given our deadlines and the relatively small sample sizes on a region-to-region basis, we opted not to provide an official seat projection, stating simply that the Kathleen Wynne would likely win a majority. In the later stages of the campaign, we provided a “likely voters” model to offer insights into the vote intention of those who are most likely to show up at the ballot booth come Election Day. While we tweaked this model several times throughout the campaign, the basic premise behind this model involved calculating a score for each respondent that reflected the probability that they would show up and vote on Election Day. The score was based a on a number of factors, including past voting behaviour, self-rated likelihood of actually voting, knowledge of one’s polling station location, age, and emotional engagement. Since it was safe assumption than only about half of eligible voters would cast a ballot, we then isolated the 50 per cent of respondents who received the highest scores and dropped the remaining cases. In short, our likely voter model did not work the way we had hoped and we will not be using this particular model again. We will be doing some more analysis around likely voters over the coming weeks, but believe that a lighter and more conservative approach with the most clearly documented linkages would make more sense. 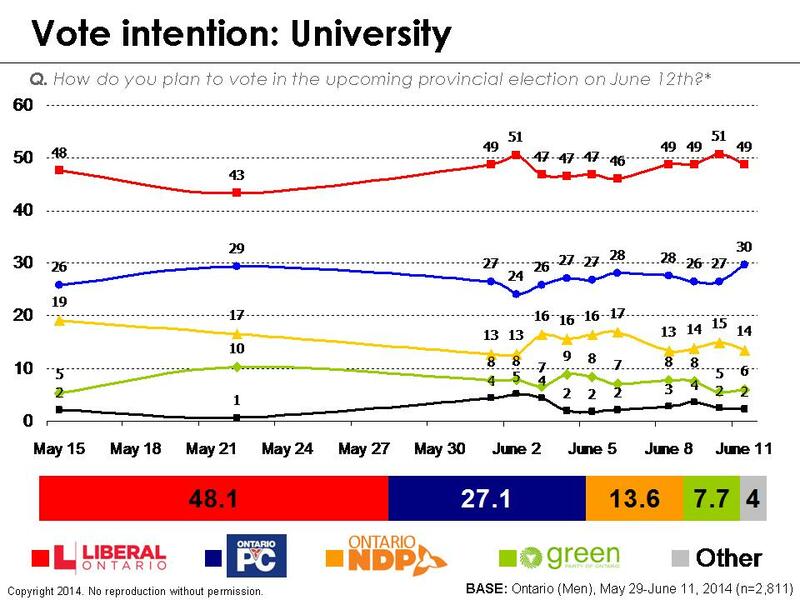 Some readers may be asking why the likely voter model seemed to be penalizing NDP supporters. NDP supporters consistently provided responses that suggested that they would be less likely to vote come Election Day; they were younger, less likely to have voted in advance, less likely to express enthusiasm for voting in general, less likely to know the location of their polling station, less likely to have voted in past elections, and more likely to express discouragement (rather than stronger emotions such as hope or anger). 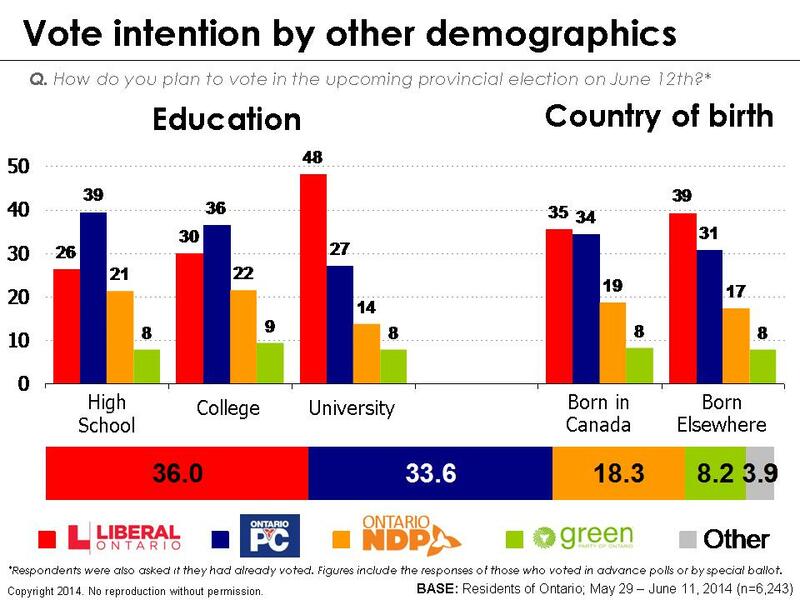 We had every reason to believe that large numbers of NDP supporters would stay home on Election Day but, indeed, they did not. Finally, we would like to take this opportunity to offer up our views on how poll results were presented in the final stages of the campaign. 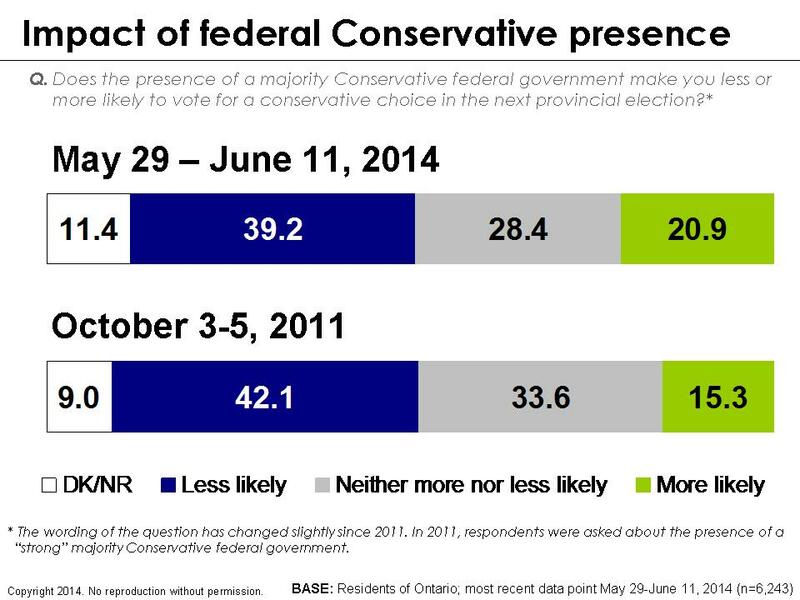 We believe that a clear and unambiguous call is an important measure of election polling. It is not enough to simply produce poll numbers that just happen to be in the same ballpark as the actual election results, particularly when these figures come out weeks before the election itself. We did not base our majority call on a single poll. Instead, it involved a reasoned conjecture based on the patterns that were established through the campaign. 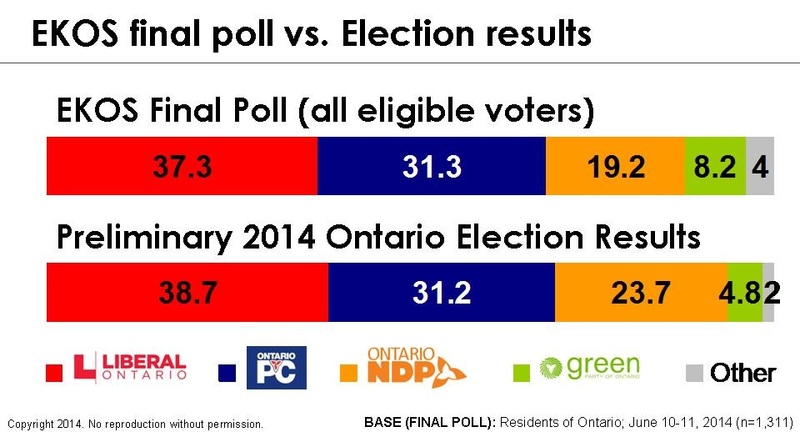 Wynne enjoyed a modest, but clear lead throughout most of the campaign. 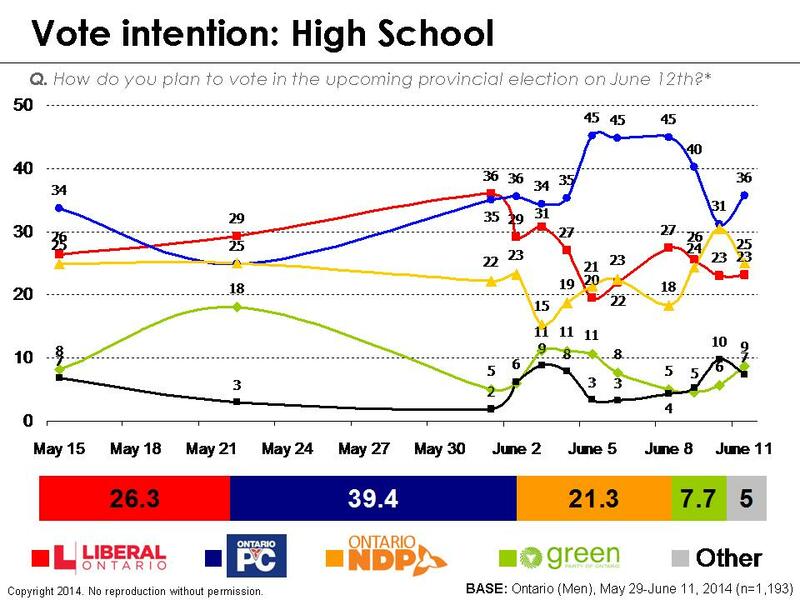 While it is true that we observed a significant shift towards the PCs in the wake of the debate, this surge quickly receded and the results promptly returned to their pre-debate levels. 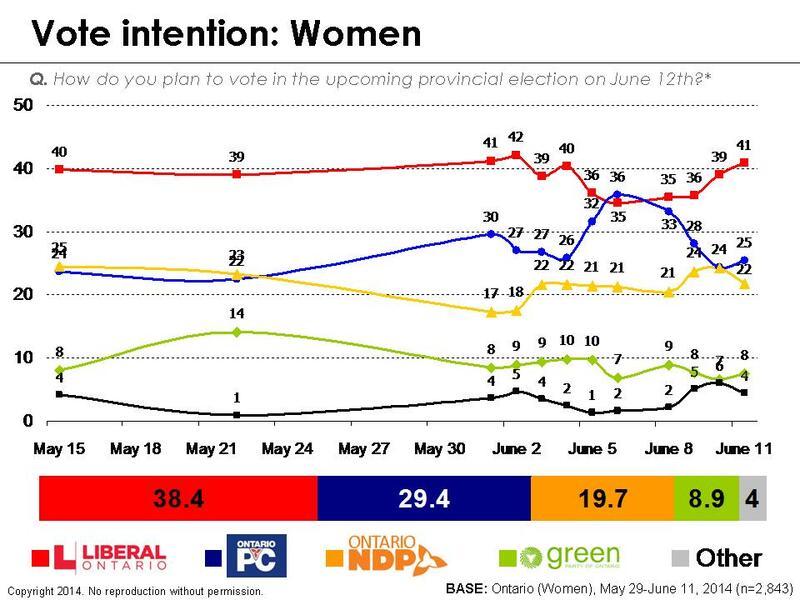 Furthermore, her key constituencies – most notably women, university graduates and those in the Greater Toronto Area – were unwavering in their support. It was for these reasons that we were able to see the actual result coming. The patterns were clear and consistent and, from the vantage point of our data, there was no justification for vaguely deeming the election to be “too close to call”. 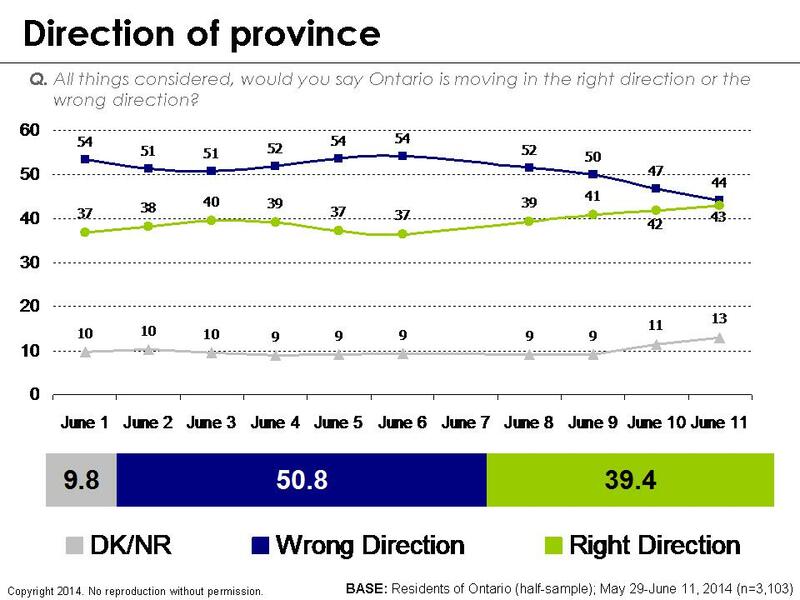 There is a clear difference between seeing and calling the outcome based on the overall trends in the data and having a single poll which looks like the outcome, but where no such prediction is made. In closing, we would like to thank the 6,243 Ontarians who generously took the time to participate in our surveys over the course of this campaign. We applaud the candidates who had the courage to throw their hats in the ring and we congratulate Kathleen Wynne on securing a majority government. We congratulate the voters who had the commitment to actually show up and be counted. We also thank our sponsors at iPolitics who have staked out an interest in a more ambitious program of research. We also acknowledge the skill and commitment of our colleagues and competitors who enter the arena of political polling in an era of diminished resources and rising methodological challenges. Congratulations. You had it right and almost everyone else had it wrong. True, some pollsters and 308 had the percentages fairly close. But they were still predicting a close election, a reasonable chance of a PC win, and little or no talk of a Liberal majority. As you say, it is the outcome – who wins and whether it’s a minority or majority – that matters and you had it and they didn’t. 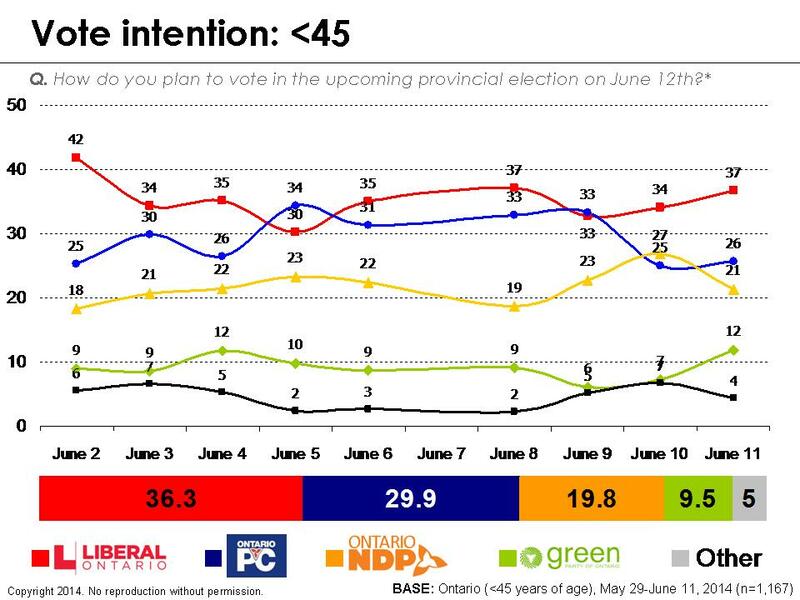 Do you have speculation about why some respected polls were so off?